On February 25, we will be celebrating a couple of things. One year since I started Couch-2-5K and, as a result, one year since Runs With Pugs began. I can’t even believe it. Almost 365 days ago, I could barely run for 60 seconds without wheezing and feeling the painful jab of a side stitch. Now, well, I still wheeze a bit, but I’ve run two half marathons and a bunch of other races, and love every minute of it. I think it’s safe to say that a year has been pretty good to me. Or, at the very least, I’ve learned to pose better. But I didn’t do it alone. I would never have come this far without all the amazing support and love from my husband, our little one, our family and friends… and you, readers, fellow runners and members of one of the most amazing communities I have ever known. You all have been there since the beginning. You were there for my first running steps, my first shoes, my first race. You were there through a surgery, a recovery and some funks. For PRs and PBs and all the triumphs along the way. For the ups and downs, the highs and lows, and everything in between. I couldn’t have done it without your encouragement, your suggestions and your advice. With you help, I’ve gotten stronger and faster, and more secure in myself as a runner. I’ve met (both online and in real life) some truly amazing and inspiring people. It’s been such a great year. And I want to say thank you to all of you who helped make it so. For the next five days, Runs With Pugs is going to be showing our love and appreciation for you. We’ll be giving away some great gifts and prizes – race entries, goodies and some of our favorite running things. Congrats on a great year!!! Happy Anniversary! Couch to 5K changed my life as well. What a great program! Yay! Congrats on 1 year. It is so amazing what a difference a year can make! Congrats. You had a great year! Darlene recently posted…Maybe I Should Have Skipped This One? Really? I feel like you’ve been doing this for years! I love a good extravaganza! 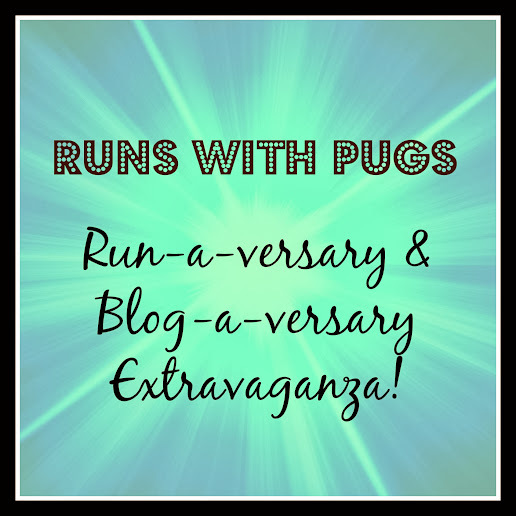 Happy Run-a-versary and happy blog-a-versary! It’s been a fun year getting to know you! Actually, not a full year for me…. I think I found your blog right after you had your surgery. Was that the spring or early summer? CONGRATULATIONS! I cannot believe that you have only been doing this a year! I feel like not only are you such an established runner, but your blog itself is fab, I can’t believe it’s only a year old! Here is to many more to come! Thank you, Anne! I kind of can’t believe it either! It’s been such an amazing journey. And the best is yet to come!